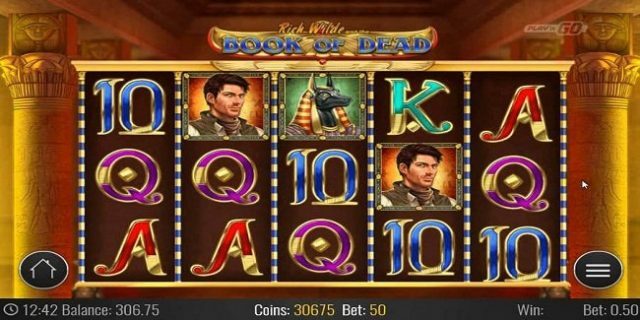 Book of Dead is 10 Paylines and 5 reels video slot game powered by Play’n Go software. This slot provides a tremendous jackpot of 5000 coins to the players and return to the player (RTP) is 95.6%. Minimum coin size for the game is 1, while maximum is 5 and coin sizes for the slot ranges from 0.01 to 2. This slot is inspired by Ancient Egypt culture. The reels of the game are being set against the golden ornate frame. This slot game contains an incredible design. You can play Book of Dead slot at any Play’n Go Casinos for free or with the help of real money. Before you start playing at this slot you should take an eye on options available in this game. “Lines” can be used to set the number of lines to bet on and it ranges from 1 to 5, “Coin value” can be used to set the coin size from 0.01 to 2, and “Bet Max” option can be used to set the maximum bet that the slot allowed. The game also includes “Auto Play” and “Spin” option which means in “Auto Play” you can play the game for a number of times without any interruption and “Spin” is used to start the game. The Book symbol in this slot acts like wild as well as scatter symbol. You could win up to 10 free spins if landing at least 3 scatter simultaneously anywhere on the reels. This game is one of the best from Play’n Go Casino software. You can really win big amount of money if playing this Book of Dead slot game at your own place.